A pig has pink skin, ears, and a big nose. They have a short, stubbed tail and their snouts protrude from their face. Adult boars also have white tusks on either side of their snout. Pigs are mainly butchered for Porkchops. Porkchops are slightly less filling than beef or mutton, but this is made up for by the fact that pigs drop more meat than Sheep, and have many more offspring than Cows. The larger the pig, the more porkchops it will drop upon death. Pigs are one of the most commonly spawning passive mobs. When they encounter obstacles, pigs will often answer them by hopping up and down, apparently attempting to jump over them regardless of whether this is actually possible. 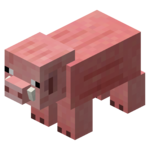 Pigs' pathfinding is similar to other passive mobs; they avoid harmful falls and attempt to go around obstructions. When struck by lightning, pigs turn into zombie pigmen. This is a very rare event as there are not many thunderstorms and pigs are a small target for lightning to strike. Baby pigs that get hit by lightning also turn into zombie pigmen. Pigs can be bred with all grains except rice. Unless they are separated, piglets will follow their parents or other adult pigs until they become adults themselves. A piglet looks similar to an adult pig, but its body is smaller with a large head and male piglets do not have tusks. They take 3 months to fully grow into adulthood. Due to the mass quantities of offspring, breeding multiple females in an enclosed area often results in what is referred to as a "pigsplosion."